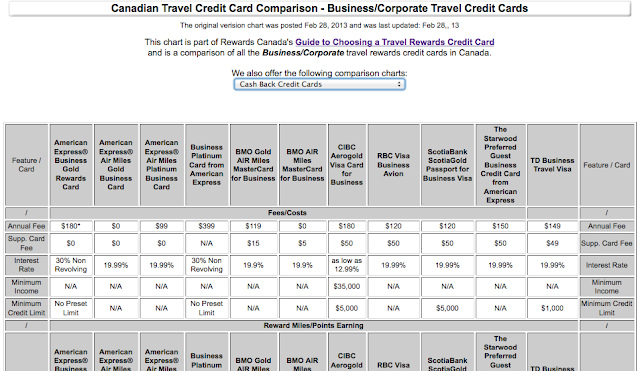 The main news for today comes from ourselves as I am pleased to introduce the latest Credit Card Comparison Chart on Rewards Canada, this time it is for Small Business/Corporate cards. If you are in the market for a card for your company be sure to check it out. You can find it here. Super quiet Tuesday here at Rewards Canada, just a few bonus offers added and nuttin' else! American Airlines is another airline that is offering its 2012 Elite members the chance to buy back status. 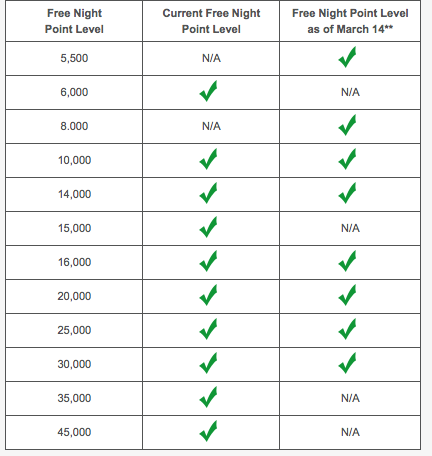 If you are currently an AAdvantage Platinum or Gold member, and you have flown at least two elite qualifying segments during 2012, and did not participate in this offer last year, then you are eligible to renew your status. More details can be found here. As I mentioned earlier in the month, Starwood Preferred Guest and Delta Airlines have teamed up to create Crossover Rewards. The new cross-functional benefit for SPG Elites and SkyMiles Elites is now open for registration. You can do so here. For more details on Crossover rewards see my post here. Super quiet Tuesday here at Rewards Canada, just a few bonus offers added and nothin' else! Tip of the Day: Make sure you are maximizing your mileage earning! Check out Rewards Canada's Maximize your Miles feature for tips on how to earn more miles. - 250 Bonus Dividend Miles for joining The Whiteboard & another 250 miles for completing your first survey. More... Until ? As is typical with Monday's there isn't a lot of news to pass your way although there are a couple of bonus offers to make note of. Cathay Pacific has launched another flight promo out of Canada, this time they are offering bonus miles on flights between YVR and YYZ and Hong Kong that are booked in First or Business Class. This promo is running along side their Premium Economy offer so right now you can earn bonus miles in all classes except Econony class. For more details see the link below in the bonus offers section. Choice Hotels has also launched their next systemwide promo, one that we have seen time and time again where you can earn a free night at roughly 1,500 of their hotels by earning a bonus of somewhere between 5,000 and 8,000 points after two stays. When are these programs going to come up with something more creative? (same with CX above, same promo we've seen many times) Perhaps they need to hire me (FYI loyalty program managers: The FFB Group does provide loyalty promotion consulting if you are reading this) to get them some traction with better thought out promotions! Tip of the Day: Looking for a new Travel Rewards Credit Card? Be sure to visit Rewards Canada's Guide to choosing a travel rewards credit card before you make a decision to make sure you are getting the right card for you! Another day filled with lots of new rewards information for you! Air France and KLM are once again running one of their great business class sales. Fares from Toronto or Montreal including all taxes start at $2599 for Europe and $3099 for Asia. 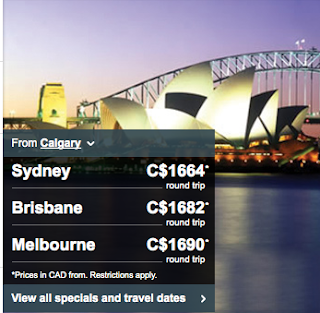 From Calgary and Vancouver its $3099 for Europe and $3599 for Africa/India. This is the increased sign up bonus I mentioned about 2 or so weeks ago. Looks like Amex held off on releasing it so that it wouldn't come out the same week as their new Air Miles Reserve Card. Now it is here and the offer matches that of the Reserve Card which I find a little surprising they make it the same as outside of some the extra benefits that the Reserve Card offers this card is cheaper yet earns the same amount Air Miles Rewards Miles (Sign up bonus and earn rate). I still have to confirm this, but apparently this level of sign up bonus for the Platinum Card will remain as standard from this point forward. American Express is not responsible for maintaining or monitoring the accuracy of information on this website For full details and current product information click the Apply Now link. Busy day here at the FFB Group! 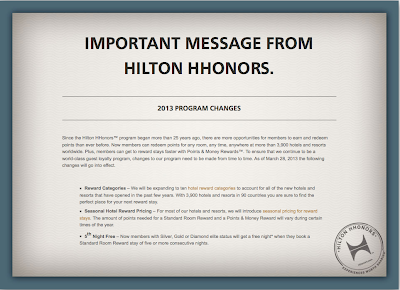 The big news over the past 24 hours comes to us from three hotel reward programs in terms of award night changes, Hilton HHonors (see my post from earlier today), Starwood Preferred Guest (see my other post from earlier today) and Wyndham Rewards (see below). The majority of the changes are not good! KLM is changing their luggage rules for flights in Economy Class within Europe as they will start charging for any checked bags as of April 22. The charge for checking a bag is EUR15 if you select it in advance at time of booking or EUR30 if you do it at the airport. You can avoid this fee by simply joining the Air France KLM Flying Blue program for free (see this promo for Canadians) or their Blue Biz corporate program or fly on a fully flexible economy class ticket (Y or B). Intercontinental flights remain free (this is the most important for those of here in Canada) and flights within Europe that go to Georgia, Italy, Turkey, the Ukraine, Russia or Belarus. More details can be found here. I posted another special feature here on the blog portion of Rewards Canada yesterday, covering Credit Card Medical Insurance Coverage. If you didn't read it you can do so here. 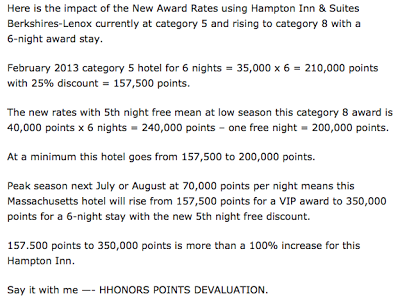 Hot on the heels of the big Hilton news comes an announcement from Starwood Preferred Guest on their annual hotel award category adjustments. 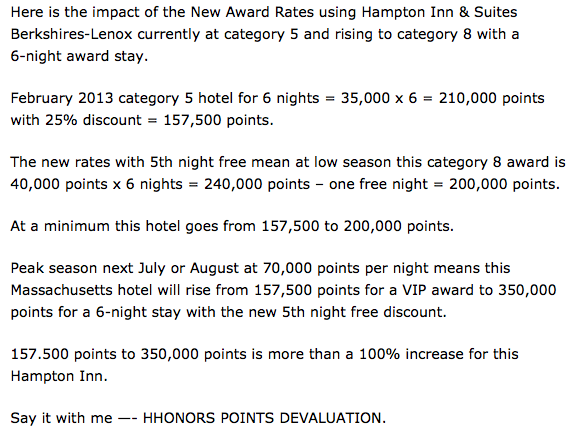 Perhaps SPG is hoping their announcement will be drowned out by the HHonors devaluation. Unlike Marriott, Hilton, or Priority Club, SPG is not introducing new categories but the announcement on Milepoint.com tells us about the individual hotel movements in point requirements coming on March 5th. Overall 47 properties will move down a category while at least 20% of all of Starwood's hotels will be moving up in categories including one of my perennial favourites, the Westin Ka'anapali Ocean Resort Villas. 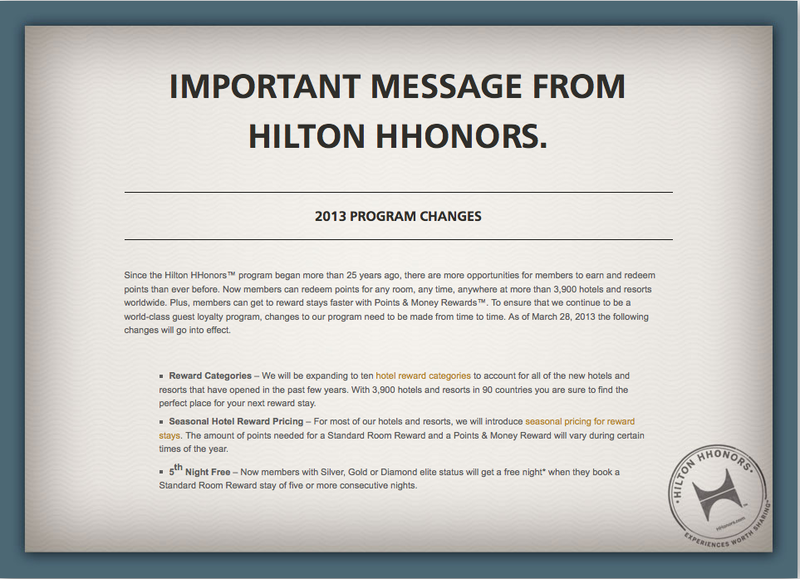 Overall SPG's changes aren't as drastic as the other main hotel reward programs but with over 200 hotels going up it still isn't good news for SPG members. Luckily enough, SPG has provided a list of the hotel changes which you can download here (PDF). If you have any planned redemptions coming up you can consult this list to see if you should redeem your Starpoints before March 5 or wait until after. With the emergence of Credit Card Emergency Travel Medical Insurance coverage over the past few years, I have been receiving more and more requests from some of Rewards Canada 'seasoned' readers about coverage once they hit 65 years old. I did look into this a few years back and just personally responded via email to those who asked. But somehow when 2013 hit, I have already received numerous emails asking about which credit cards provide Emergency Travel Medical Insurance coverage for people over the age of 65. So I figured it was best to summarize all the information into one post. I have gone through all of the major Travel Rewards credit cards in Canada that provide this insurance benefit and summarized their age coverage in the chart below. If you are young (or young at heart) and go party in Cancun during Spring Break, many of the cards will not cover you for medical emergencies that happen while you are intoxicated. Certain dangerous or professional sports are not covered, even Scuba Diving is an exclusion unless you hold a basic designation from a certified school or licencing body. "No benefits will be payable for surgery or invasive procedures (such as cardiac catheterization) without prior approval by Scotia Assist, except in extreme circumstances where a request for prior approval would delay surgery needed in a life threatening medical crisis." So please, before you choose a card based solely on the medical insurance please read the policies of those that you are considering before making your decision. A quiet end to what turned out to be a pretty busy week! What does this mean for Canadians? Once the merger is complete, Star Alliance will lose US Airways which means Aeroplan, the biggest frequent flyer program in Canada will lose them and this will mean less seat availability on certain routes when trying to book Star Alliance award tickets. On the otherhand, Canadians who are oneworld alliance flyers like British Airways Executive Club, Cathay Pacific Asia Miles could see more availability on flights out of Canada depending on what routes the new airline will keep. I assume routes like YYZ-PHL will be kept but some like YYC-PHX may go the way of the dodo bird. Ultimately only time will tell what happens but I don't think it is a huge loss to Aeroplan members, especially for those of us out West here where US Airways doesn't have a big presence. What could be a much bigger loss is the disappearance of the US Airways 100% bonus on buying Dividend Miles which I have talked about numerous times here on RC. It is (was) always a good way to get business class flights to Asia or Europe on Star Alliance for a relatively low cost (~$1800). American AAdvantage has been running lots of buy miles promos lately and those will most likely continue but they aren't as lucrative as the Dividend Miles promo. Air Canada has expanded their current systemwide flight bonus for higher fare class tickets to include an additional bonus of 500 Aeroplan miles when you fly to or from select U.S. cities. See the link in the bonus offers below for more details. In case you missed my post last night, American Express and Air Miles introduced a new premium credit card call the American Express Air Miles Reserve Credit Card. Air Miles, Canada’s largest loyalty program has long had credit cards that earn Air Miles Rewards Miles which also offered some standard credit card benefits but none like those found on some of the higher end premium travel cards. Enter the latest offering from American Express and Air Miles, the American Express AIR MILES Reserve Credit Card which is the first premium Air Miles card in the market. After discussions with sophisticated travelers (I would hope some of you were included since I like to believe the Rewards Canada fan base is quite sophisticated) and avid Air Miles collectors, American Express determined that there was a niche for a higher end card to be co-branded with Air Miles. The card will be officially released tomorrow (Feb 14) but I have been provided with an early preview of what the card will be like. The American Express AIR MILES Reserve Credit Card will offer 1,000 Air Miles Reward Miles as the standard sign up bonus although like almost every other card out on the market today we could expect to see even higher sign up bonuses in the future. The sign up or welcome bonus as Amex refers to it is awarded after spending $3,000 in the first three months of cardmembership. Once you get the card you will be awarded with an annual short haul companion ticket (up to 1,450 Reward Miles) that can be used when booking another Air Miles reward ticket. The redemption and benefits side is where some of the big changes and enhancements come in when compared to other Air Miles credit cards and pulls ideas from The Platinum Card from American Express. the introduction of Air Miles FlexFly which lets you book any seat on any flight at a rate of 770 Air Miles for every $100 of travel booked when you cannot get a flight via the reward chart. This is similar to the booking options allowed to all Air Miles members where you can book any flight but it will cost you more miles depending on the cost of the flight but the rate this card has should be better. and the big one….. cardmembers will be able to redeem for Business Class flights! While Air Miles has occasionally run promotions for Business Class redemptions, this will be available all the time for Air Miles Reserve cardmembers. Apparently Air Miles will be able to book business class seats instead of economy from their existing inventory provided to them from their airline partners and if there is no availability then once again cardmembers can take advantage of the Air Miles FlexFly option of redeeming 770 points for every $100 spent on flights. Access to an exclusive AIR MILES concierge service, which will have a dedicated phone number, which for anyone who has called the main AIR MILES line to redeem can attest to being a great advantage. So what will this cost you to get all these benefits and enhancements? The primary card is $299 per year with supplementary cards coming in at $50. When I first heard $299 I can admit I was a little shocked, not because I haven’t seen prices like that (the Platinum Card from Amex is $699) but when I associate anything with Air Miles, I see people wanting to get a good deal at a good value . But then again this card is not targeting the general Air Miles populous, its targeting avid collectors who do redeem most of their Air Miles for travel and those wanting enhanced travel benefits. One can look at the companion fare as almost being covered by the $299 but I still feel this is high. The WestJet World Elite MasterCard has a $99 companion fare which can take you farther and that card only costs $99. Granted it has less travel benefits attached but it’s not too far off. The BMO World Elite which offers similar Priority Pass benefits is only $150, the American Express AeroplanPlus Platinum is $200 more with a companion fare, a better insurance package and very good lounge access plus it also has the Toronto Pearson benefits and comes out stronger for business class tickets. In my mind this card should have come in with a $199 annual fee to make it more attractive and competitive with cards that offer similar benefits. 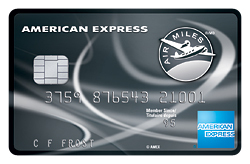 Ultimately I think this card is a great step for the American Express Air Miles partnership. The majority of Air Miles credit cards have lacked on the benefits side and this card steps up to the plate to fill that void. While I won’t be getting the card since I am not a big Air Miles collector anymore, I know of many who will and those people will be the ones who do use their Air Miles primarily for travel. When you take into account the benefits, the earn ratio and even the small things like waiving the booking fee, this card is the best Air Miles Reward Miles card to date and you should jump on it if you fall into that category. If you don’t travel much and/or don’t use your Air Miles Reward Miles for travel you are probably better off saving the money spent on the larger annual fee by going with one of the other American Express or BMO Air Miles credit cards. Be sure to keep an eye out in the near future here on Rewards Canada as I give the card the standard unbiased “Rewards Canada Review”, the addition of the card to my famous credit card comparison charts and to see where it ranks in Rewards Canada’s 5th Annual Top Travel Rewards Credit Card feature later this year! As always I would love to hear your thoughts, comments etc. Just leave a comment below! Wyndham Hotels and Aeroplan have teamed up for a contest. The contest is open to Canadian residents who are Wyndham Rewards members (free to join via the contest if you are not a member) and the prize is 1 Million Aeroplan Miles. The good side of me is sharing this with you as the devil on my other shoulder is telling me don't tell anyone as more people will enter the contest and your odds of winning go down! Glad I don't listen to that side! You have until April 30 to enter and you can enter the contest here. 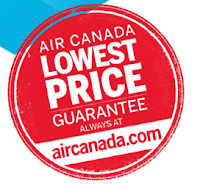 Air Canada has introduced a Lowest Price Guarantee for booking on AirCanada.com that guarantees if you find a lower Air Canada price (at least $5 lower) on any other online travel retail site within 24 hours, they’ll match it and offer you a $50 credit. The guarantee only applies to Air Canada , Air Canada Express (operated by Jazz Aviation LP, Sky Regional Airlines Inc., Exploits Valley Air Services Ltd or Air Georgian) or Air Canada rouge flights from Canada with codeshares being excluded. You can find all the details here. My wording may have been a bit vague yesterday about the new card being launched. The information will be posted here on the Rewards Canada blog at 5:30PM EST tonight. This launch also makes me think it is the reason why we haven't seen the increased sign up bonus that I was advised of for another card. A busy day outside of my regular updates kept the bonus offers low but there is a decent amount of news to pass on to my readers! 73% of the program's properties will remain in Categories 1-4. Marriott has provided a PDF (see link here) of all the properties that are changing. A key thing to look at in these changes are the 300+ hotels moving from Category 4 to 5 as many of us receive free nights via Marriott's MegaBonus promotion that are only good at Cat 1-4 and there are 175+ properties moving to Cat 6 from 5 which will affect Marriott Premier Rewards Visa cardholders annual free night benefit which is good up to Cat 5 hotels (they will also potentially lose out on the Cat 1-4 sign up free night offer). There is a new credit card coming out tomorrow in the Canadian market. I'll have all the details posted at 5:30pm EST! Heads up on another Aeroplan and Home Hardware offer. You can earn 2x Aeroplan Miles on purchases once again from Feb 13 to 23. If you hold an Aegean Airlines Gold Miles&Bonus Card (in particular those of you who used this to get to Star Alliance Gold faster!) you now have greater access to security fast track lanes at airports in Europe. For the complete list see here. Over the weekend I was featured ever so quickly on Global TV Calgary's Sunday Morning news talking about how you can only collect miles (or in this case WestJet dollars) for yourself on a flight and no one else on your booking, that the others have to have their own FF numbers to collect. I believe most of you who visit Rewards Canada know this but according to Tony Tighe at Global this was not the first time he was asked this. I think his FYI is a good as there are many Canadians out there who are not 'savvy' with their programs and do not understand or read all the rules that come with them. Check out American AAdvantage's discounted reward offer for flights to Hawaii from the U.S. and Canada. Only 30,000 AAdvantage Miles will get you a round trip flight in Economy Class. For those of us here in Canada this is best taken 'AAdvantage' of by current American AAdvantage members with enough miles in their accounts and since AAdvantage no longer has a credit card in Canada your best credit card bet for this offer is for holders of the Starwood Preferred Guest Credit Card from American Express as 25,000 Starpoints will get you the 30,000 AAdvantage Miles, the only question is will you get them in time to redeem before the March 13 deadline. Full details can be found here. Update: Sorry I forgot to put this in when I first posted this, the increased sign up bonus I was talking about last week for one of the cards here in Canada seems to have been delayed now.... I will keep you up to date as soon I here something.